SDHC Cards use a FAT32file system, a specification that was established for applications with higher capacity needs and are especially suitable for high-quality video. The increasing use of high-definition video, high-resolution digital photography and mobile applications demands higher storage capacity and more demanding data transfer rates. Because of this, SDHC cards guarantee a minimum sustained data transfer speed, not a maximum speed. 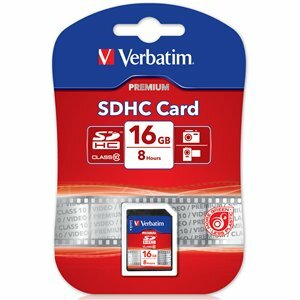 Verbatim SDHC Cards are fully compliant with all applicable SD standards. They also contain a write protect feature to prevent accidental erasure. SDHC cards use the same physical format as SD cards but cannot be used with SD host devices that do not comply with SDA Specifications Version 2.0.